Supporting innovative advances in medical technology, Supervisor Solis presented a check in the amount of $78,225 to the Rancho Los Amigos Medical Center Foundation for the purchase of a robotic device that helps those who have suffered a spinal cord injury walk again. “Trauma patients, particularly those with spinal cord injuries, have a fighting chance to be stabilized here at LAC+USC and then go to Rancho to rehabilitate,” said Supervisor Solis at a press conference on July 31 at LAC+USC Medical Center where she presented the check. Supervisor Solis visited Rancho Los Amigos National Rehabilitation Center in March and was inspired to donate funds for the purchase the robotic device – known as Indego – that helps Rancho patients affected by spinal cord injuries walk. 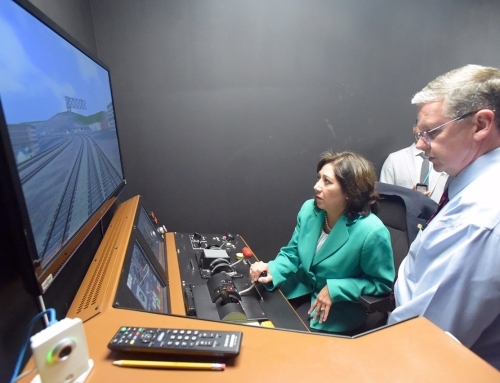 “During my visit to Rancho, I was given the opportunity to see how the Indego works,” Supervisor Solis said. “When I heard from a patient that it was the first time in 20 years that he was able to stand with the use of the device, I was overcome with emotion. “To think that this device provided this patient with hope, strength, courage and realizing the dream of being able to stand and take steps for the first time in two decades made me want to expand the reach of the device further,” said Supervisor Solis, who represents the First District. Residents from the First District at LAC+USC represent the majority of referrals to Rancho’s rehabilitation program. Exoskeleton technology is also known as Indego – and the name Indego comes from “Independence” and “Go.” Indego, the robotic device, only weighs 26 pounds and is small by design so that individuals can wear the device while sitting in a wheelchair. Indego can be quickly setup and is easy to transport, as it fits in a duffle bag.